Gov. Jerry Brown has rejected parole for a third time for a follower of cult leader Charles Manson 46 years after a series of bloody murders rocked Southern California. Bruce Davis was convicted of the 1969 slayings of musician Gary Hinman and stuntman Donald "Shorty" Shea. He was not involved in the more notorious killings of actress Sharon Tate and six others. Brown said on Friday that the 73-year-old Davis remains a danger to public safety, saying in his decision that the "horror of the murders committed by the Manson Family in 1969 and the fear they instilled in the public will never be forgotten." The governor said Davis spent years downplaying his role in the family. 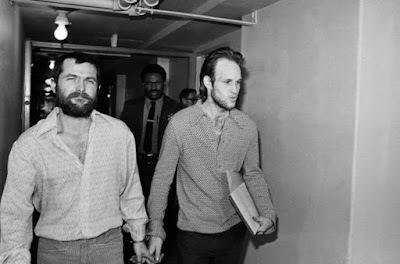 "As I've discussed twice before, Davis's own actions demonstrate that he had fully bought into the depraved Manson Family beliefs," Brown wrote in his decision. "He not only watched as Manson cut Mr. Hinman's face open with a sword, but held him at gunpoint while Manson was doing so." Tate's sister Debra Tate, who spoke against Davis's parole at his hearing to represent Manson's victims, had not yet heard about the governor's rejection when reached by phone by The Associated Press. "Oh God, I am so glad he did that," Tate said. "I have been sweating bullets, as you can imagine." 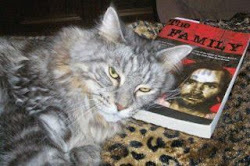 Tate said the consistent rejection of parole for Manson followers from governors through the years has not given her any comfort, and California's recent moves to release older prisoners have left her especially worried. "I see it as a very viable possibility that all of them could be let out," Tate said. "None of them are secure." It looks like Bruce & Clem are holding hands in that picture. LOL. I'm getting clobbered with snow right now. Hi Lynyrd. You'd better power up that snow blower. LOL. Happy Birthday in Heaven, Sharon. Hope the heating's working and you're wrapping up, Lynyrd. Stay safe, and warm. Same to all affected. How cold is it where you are? And how deep the snow? Winter is just getting into full swing here. It seems the season started kinda late this year. We got about 8 inches of snow, and the nights are about 20 degrees (farenheit), which actually isn't too bad for late January. Last year at this time, we got a 32 inch blizzard and temps were below zero every night. I refurbished my snow blower a couple weeks ago. I installed a new carburetor and did a tune-up. It running like a top! (Not bad for a 21 year old machine) . In London, it's windy but as mild as spring. We did have a bit of snow a week ago though. But nothing that caused anyone to watch their step. Thanks Grim, it was 74 degrees here today. This is when it's nice to live here. Tomorrow, cold front, back to 58 degrees. LOL.